Sandy is a small town in East Bedfordshire which takes its name from the Sand Hills of its distinctive rural setting. Located on the Great North Road (A1) Sandy has the benefit of easy access to the main commercial centres of London (only 45 minutes by train), Stevenage, Bedford and Cambridge. The population of the town is currently c 12,000 based on approximately 5,000 dwellings. The town is surrounded by the pleasant landscape of East Bedfordshire with its market gardening heritage and variety of villages, woods, heathlands rivers and brooks. Look at the map at the bottom of the page for travel routes around the town. Sandy’s long and fascinating history commences some thousands of years before the arrival of the Romans, yet it is this event which is perhaps the most significant as the story unfolds.The Roman invaders left the town early in the fifth century and in early English times, Sandy formed part of the Kingdom of Mercia. The Manor of Sandeia is recorded in the Doomsday Book, as being the area that we now know as Sandy. The present day parish of Sandy, excluding Beeston, still traces the same area as the original 4,000 acre Manor. By 1290 it had split into three smaller estates: a smaller Sandy Manor still under the Beauchamps and two under local monasteries: Hasells under Chicksands Priory and Girtford under Cauldwell Priory, Bedford. Although there are remains of an earlier church, it is the thirteenth century that gives the earliest formal record of a religious building being in existence. In 1240, William de Beauchamp is recorded as granting a church in the town to Cauldwell Priory. Almost a century later a chantry was established. Records give the date of 1332 as being when the chapel was endowed for the chanting of masses. Sandy Manor descended to the Catlin family and then by marriage to Lord Spencer, whose son was created Earl of Sunderland. In 1670 it was acquired by Sir Humphrey Monoux of Wootton, a descendant of a former Lord Mayor of London and one of the Justices who committed John Bunyan to prison in Bedford. His grandson Humphrey rebuilt the mansion - now the site of a middle school, while another grandson built the rectory in 1731, demolished in 1964. Ownership of Sandye Place passed through several names in the 19th Century including Brandreth, Foster and Edgecumb. Girtford and Hasells Manors had passed to the Crown at the dissolution of the monasteries in 1539 under Henry VIII. The King gave Girtford to John Burgoyne in 1541 and Hasells to Francis Pygott in 1542. Hassells or as now spelt “Hazells” Hall, which stands in a wooded park north east of Sandy, dates back to 1660 but was enlarged extensively twice during the 18th century after passing into the Kingsley family and then in 1748 by marriage to the Pyms. Lord and Lady Pym still live on the estate. 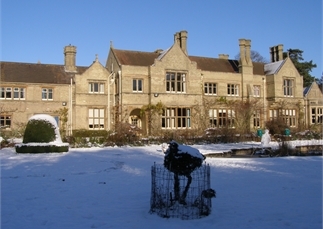 Hasells Hall was saved from demolition in 1979 and has since been converted to 12 houses and flats. Sir William Peel, a son of Sir Robert the former Prime Minister and founder of the Police Service, bought the estate in 1851 and his brother Arthur Wellesley Peel built The Lodge, a fine residence standing in over 200 acres in 1870. This imposing property is now the headquarters of the RSPB. Beeston, mentioned in the Domesday Book, is now in Sandy parish but was originally part of Northill. The manorial rights have been held over the centuries by several private individuals, notably in recent times by Godfrey Thornton of Moggerhanger House, Allen Jeeves, Albert George Jeeves and now Sandy Town Council, as successors in title to Sandy Urban District Council, which acquired the freehold of The Green in 1956. A new Turnpike Trust set up in 1725 brought improvements to the Great North Road and in 1758 came the completion of the Ivel Navigation Scheme, taking coal lighters from Tempsford through Biggleswade to Shefford. This was followed a century later by the building of the Great Northern Railway and afterwards the Sandy to Potton Railway built privately by Captain William Peel. The line was later taken over by the Bedford and Cambridge Railway, eventually linking Oxford to Cambridge. At that time, Sandy had three stations: two on the existing site, one for each railway, and one at Girtford on the Bedford line. Each had its own station master. The explosion in communications throughout the two centuries allowed Sandy to fully exploit its best asset, the acres of rich farming land surrounding the town. Market gardening thrived as growers were able to transport produce quickly from the fields to the town and on down the Great North Road and later on the railway to the London markets. During the late 18th century almost all the land cultivated in Sandy was in open fields with names such as Austred, Belland, Chester, Down, Low, Kenwick, Mead and Middle - from where the present-day Middlefield Industrial Estate in Sunderland Road takes its name. By the turn of this century, many of the town’s present landmarks were in evidence: Potton Road cemetery was opened in 1891; the Conservative Club was built the same year and enlarged in 1897 to include a large concert hall and facilities to house the town’s lending library. The Town Hall, interestingly never used as a town hall, now the Roundabout Club, was built in 1906 and by 1920 three schools were listed. The population of Sandy grew steadily from 1,115 in 1801 to 2,118 in 1861 and 3,110 in 1901. Sandy Parish Council was created in 1894 and its first meeting was held in the new Council Chamber on the first floor of the recently constructed Fire Station in Cambridge Road. In 1927 Sandy Urban District Council was formed conferring “town” status on Sandy. Local Government Reorganisation in 1974 saw the demise of UDCs and the formation of a new Sandy Parish Council which later that year changed its name to Sandy Town Council. During the lifetime of the Town Council Sandy has continued to evolve whilst retaining its distinctive setting in a rural environment. The expansion of the town which began in earnest after the second World War included the development of a London “overspill” housing scheme between Sunderland Road and St Neots Road and continued in the 90s with the creation of new housing at Fallowfield and Ivel Park. During the 21st century housing development has been on a smaller scale, with more infill developments but the potential of Sandy as a commuter town for workers in London, Cambridge, Bedford, Stevenage and Peterborough remains thanks to the A1 and the railway links. Beeston is a delightful hamlet which sits within the parish of Sandy and is half a mile to the south of Sandy town centre. The development of the Great North Road over the centuries means that Beeston is now bisected by the A1. This contributes to its separation from Sandy and a strong local sense of being an independent community. In the heart of Beeston is an attractive 13 acre traditional village green which is surrounded by several ancient buildings.